it has been invaded by large number of backpackers who have destroyed - at any rate during the summer months - the peace and harmony of the island. The little port of Ios, with the domed Church of Ayia Irini (17th c.) lies in a sheltered bay on the west coast of the island. 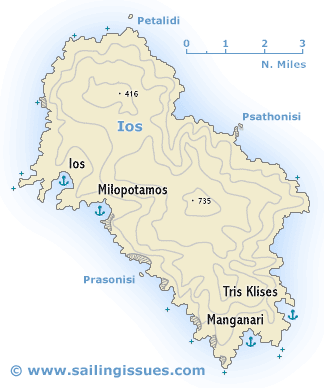 One kilometre up the fertile Kato Kampos Valley, conspicuously and picturesquely situated on the hillside, is the chief place on the island, Ios. Its white Cycladic houses and 20 or so churches and chapels are enclosed within a dilapidated circuit of medieval walls. On the hill above the village stands a double of typical windmills. Outside the main sailing season Ios has a relaxed atmosphere, there isn't much to do but you can wander around, get good provisions and you won't be disturbed by loads of backpackers. Recently the island and the port have become far more appealing, perhaps not so in August. A good option is then to explore the town of Ios in the morning and leave for Manganari Bay or Tris Klises Bay as the tourists wake up. Apart from its nightlife and nudists beaches, Ios doesn't seem to offer much else. Yet, it is a good stopover between Paros to Santorini, because in Alopronia port on Sikinos you will find only limited provisions, yet this port (also known as Skala Sikinos) is very charming and well worth a visit.